Calendar: «World Hemophilia Day», «Crohn’s and Colitis Awareness Day in Ohio», «World Hypertension Day», «Krabbe Disease Awareness Week in Ohio», «World Lymphoma Awareness Day», «Ostomy Awareness Day (World Ostomy Day)», «World Arthritis Day», «Day of Struggle Against Breast Cancer», «World Osteoporosis Day», «World Psoriasis Day», «World Diabetes Day», «World Pneumonia Day», «World COPD Day», «World Tuberculosis Day», «Rare Disease Day in Ohio», «World Day of the Sick». «It’s the way you carry it» illustrated quotation. Coping with disease, free quote pictures for Facebook, Twitter, LinkedIn, Reddit, Pinterest and other social networks. 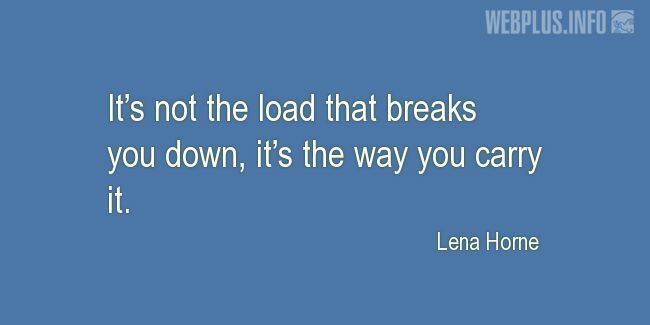 It’s not the load that breaks you down, it’s the way you carry it.